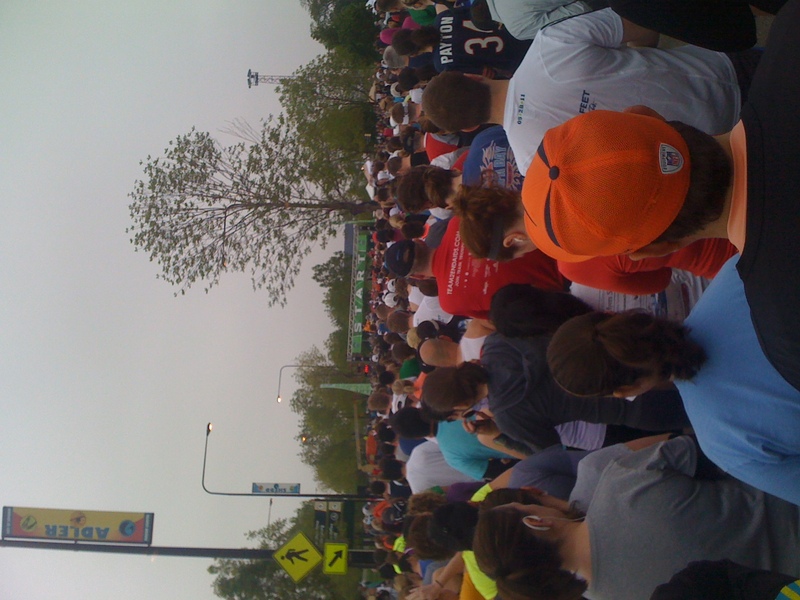 When the time came to sign up for the Soldier Field 10-Miler, I asked myself if it was a race I wanted to do again. I thought about the fact that it’s quite possibly the most well-managed event I’ve ever run. 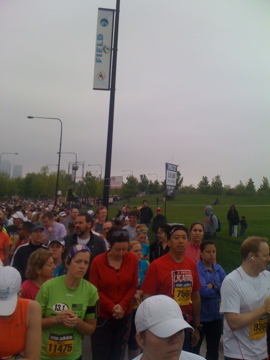 What’s more, it’s a scenic course along the lakefront and the finish is in Soldier Field itself, on the 50-yard line. I’m not much of a football fan, but finishing in the middle of a huge stadium while seeing your own face up on the JumboTron is pretty cool. So without hesitation, I found myself clicking the “Register Now!” button. Alas, I’d forgotten about training: mistake number one. 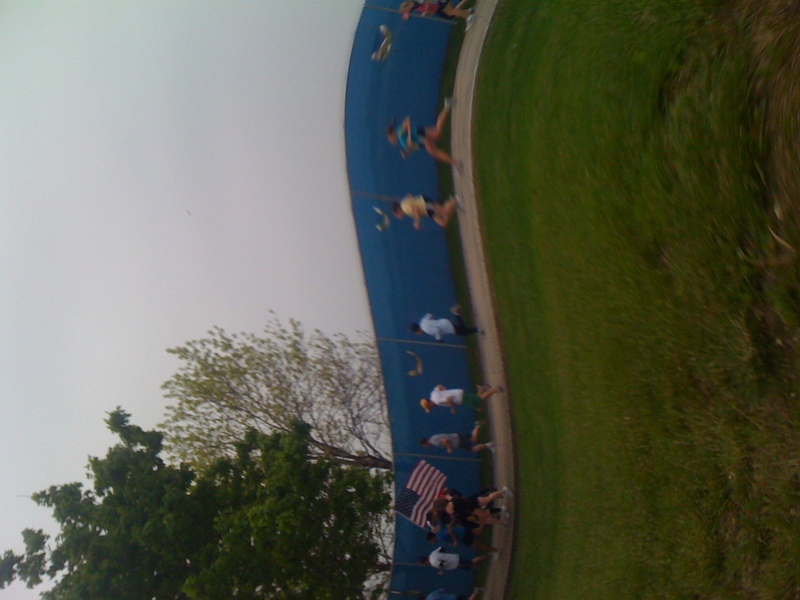 I’d done the Chicago Spring Half two weeks earlier, a rainy, windy, slow 13.1 mile effort, and then I did….nothing. Well, almost nothing: one four-mile run a week ago. That’s it. Talk about coming in under-prepared. But instead of saying that I was under-trained, I preferred to think of it as over-tapered. After all, I’d just done a half marathon, so one could argue I went straight from recovering into tapering. Or at least that’s what I told myself. 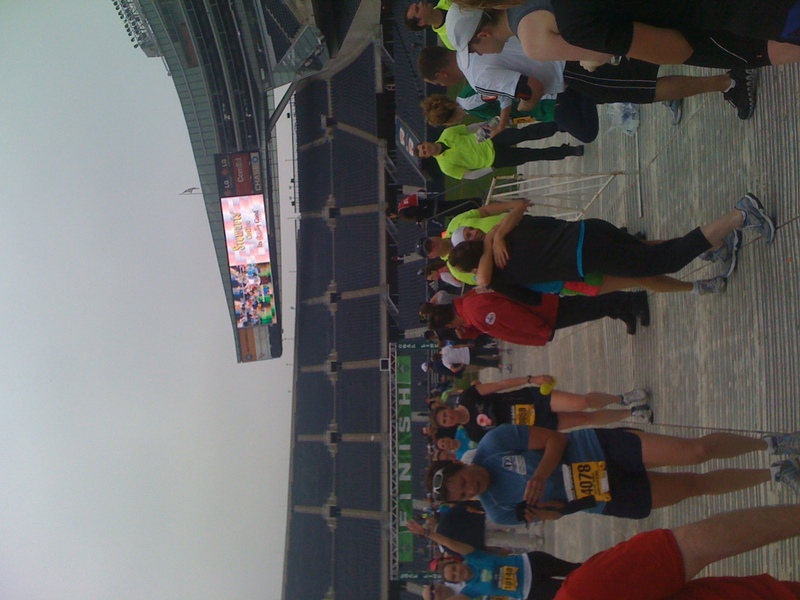 As a result of my over-tapering, I had very low expectations for the Soldier Field race. In fact, I was prepared to skip it altogether in the event of rain. As race day approached, however, the weather forecast looked perfect: cloudy and cool. I had no excuse. Rats. Unfortunately, I didn’t think much about race prep, so I forgot to eat a big dinner the night before: mistake number two. What’s more, I didn’t have much for breakfast that morning, just one piece of toast with some peanut butter: mistake number three. As I headed to Chicago, I realized I was hungry – not a good sign. I fished through my bag for some Clif bars, but found nada. I’d have to hang on ’til I got some Gatorade on the race course. Just like last year, I was amazed at how well-organized the event was. Packet pickup and gear check were a breeze. Within minutes, my friend Ilyse and I were in our start corral. Unfortunately, we were in the “Open” Corral, which meant that pretty much everybody and their brother started before us. We stood, and waited. I was getting more hungry by the minute. Ilyse had some Sport Beans, which I’ve never used before, but at that point I was starving and desperate and happy to eat anything. I also had a bottle of water, which I sipped on nervously. After a few moments, I looked down and was surprised to find that the bottle was empty. Mistake number four. Why was that a mistake? Because as we stood waiting for our wave to start, I realized I’d had too much to drink and I had to go to the bathroom, but I didn’t want to miss the race start. I was torn over what to do when the decision was made for me: our wave started moving forward. The bathroom would have to wait. Finally, 25 minutes after the official start time, we crossed the starting mat. I’m sure it was a harmless enough costume, but it struck me as a little creepy. Ilyse and I had been standing near him at the start, but moved away from him in the crowd. As I ran along, however, I looked next to me, and there he was – Blue Mask Guy. I moved to the other side of the course, but then drifted back only to find myself right beside him. I picked up speed to get a little space. About a half mile later, I looked to my right and whoomp, there he was. OK, Blue Mask Guy was making me nervous. I made a concerted effort to run fast for a quarter of a mile. I finally lost him. Then I looked over and saw my pal Chanthana cheering on the sidelines! I wasn’t expecting to see her, so I ran over to say hello and give her a hug. I hopped back onto the course with a big smile on my face. I looked to my right and GAH! There was Blue Mask Guy! I hightailed it out of there. That guy was freaking me out. Into the second mile, I was confident that I’d ditched Blue Mask Guy (although I kept expecting him to pop up out of nowhere at any minute). I relaxed and started to enjoy the run. It was time to look for someone to pace me, because I’m a lazy runner and slower than a snail when left to my own devices. That’s when I spied them: two gals in cute outfits, trotting along at just the right speed. They seemed like perfect candidates. I got behind them and followed them happily until Mile 4. Alas, I lost Girls With Cute Outfits at the water station. Fortunately, I was feeling pretty good so I didn’t panic. As I got to mile 5, however, I knew I needed some more pacers. I looked around and identified two candidates. The first was a girl wearing a bright pink shirt and sporting a large tattoo on her right leg. The other was a girl wearing a bandana with what appeared to be a shaved head underneath. She was putting out a consistent pace, so I hooked on to her. Five miles to go, and I was feeling fine, in spite of being over-tapered, under-fueled, and over-hydrated. I followed Girl With Very Little Hair, while Girl With Big Tattoo was just off to my right. My pace was getting slightly faster, but I felt good. As I ran, I was touched by all the DetermiNation/American Cancer Society signs pinned on runner’s backs indicating the names of loved ones afflicted by cancer. I looked at Girl With Very Little Hair in front of me. I wondered if her hair was shaved from the effects of chemotherapy or as a fashion statement. I didn’t know, but I vowed not to leave her. 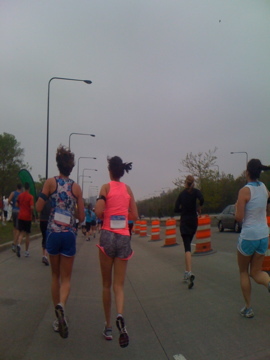 We ran along, approaching Soldier Field. As we flew, I couldn’t help but notice all the runners wearing those DetermiNation/ACS signs with people’s names, names of people who were fighting for their lives, or who, sadly, had lost the fight against cancer. For a moment I was overcome by the realization that I was so very fortunate to be there, so lucky that I’m able to be a runner, so grateful I’m not a name on the back of a shirt. Off to the right, running slowly, I saw a woman with a sign on her back indicating that she was running in memory of her sister. She looked young. I wondered if her sister had been young, too. I got choked up, holding back tears. Then I realized that my emotions were making it hard to breathe and if I wanted to maintain my pace I’d better back off on the sentimentality. After all, I didn’t want to lose Girl With Very Little Hair. I re-focused and then there it was, the final turn. I sprinted into the stadium just behind Girl With Very Little Hair, both of us raising our arms as we crossed the finish line. It didn’t matter if we’d won or set a new PR or anything else. We’d stuck it out and made it to the end. I tapped her on the shoulder and told her that I’d been behind her for five miles and that she’d done a great job. She gave me a high-five. I didn’t ask about the lack of hair under her bandana, because it really didn’t matter. Cancer survivor? Probably. But at that moment she was just a runner. And so was I. Thanks Linda! I think over-tapering will become the hot new trend, don’t you? Awesome, Sue. Congratulations on a great race, and thanks for a wonderful way to end my day. By the way, blue mask guy was wearing a luchadore mask. Mexican wrestling getup. Totally creepy but also FANTASTIC. This is why I love you Paige, because you know stuff like that. Thanks! You inspire me! I read this before bed last night and successful “over tapering” of my own resulted in a slow but steady 4 1/2 green bay trail run this morning. Hope you’re up for a couple of runs this week before you head west. But will lean on your long distance words to keep me going this summer. Quite the story! I’m bummed I missed you. I was right before Chanthana at mile 1, ringing my DetermiNation cowbell and shouting for all I was worth (well, okay, shouting for more than that ‘cuz I’m not worth much). After everyone passed, I slid over to about mile 8.6 and did it all again. At both places, I saw Blue Mask Guy, and he freaked me out too. Thanks for your wonderful comments about the DetermiNation runners and their signs. They are an amazing group of athletes doing powerful things to fight cancer and honor the people they care about. Or in some cases, perhaps like Girl With Very Little Hair, they’re showing cancer who’s boss. Glad you had a good run, despite the mental lapses.